I am obsessing over graphic sweatshirts and sweaters lately. They give an adorable touch to a causal and comfy piece. Well and the fact that this graphic is a bow sealed the deal for me ;) Hope you guys have a lovely weekend! Love this sweater- what a great find! You look so cute in glasses, too. Super cute sweater! Those shoes are to die for. Love them! you look SO cute and pretty all at once Darby. love the bow, and i love the last image (my fave) you look so happy while you are working it- so hot! Your jumper is so cute and I love your heels! Wow! That sweater is too cute! I love it! Love your shorts with the sweater! I love all the bow in this outfit without being overly girly, the lacey black shorts are so cute! LOVE LOVE LOVE this sweater! Ahhh! that is such a cute sweatshirt! love it! oh my...that sweater is the cutest thing!!! what a great color it is too....and the way you wore it with the skirt is genius! Such a fun n quirky top ! loved ur smile .. So cute and beautiful pics! Hey girl! How's everything? Its been a long time since I dont read your blog but the thing is I am really busy with my new life. I can tell by your pictures that you are as gorgeous as usual! Love your look and I am dying to have some shorts like yours! I'm loving graphic sweaters too!!! Your legs look awesome in these pics! 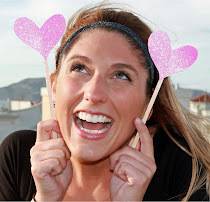 You are adorable in these pics Darby! I am also in love with graphic sweaters! What an adorable sweatshirt! I love that you paired it with dressy shorts. I hope you have a great weekend!! Darby! I have the very same sweatshirt! I wore it on my blog a few weeks back! Great minds think alike! That sweater is perfect ! Love it with the lace shorts ! That top is adorable and once again LOVE your shoes!! Between the bows and lace, I don't know what I adore more. Love this look! You make the clothes stand out with that gorgeous smile & personality Darby!!! I love that sweatshirt, too fun! Put a bow on it! This is perfect styling of a graphic sweater! Those lace shorts are divine on you, pretty lady! 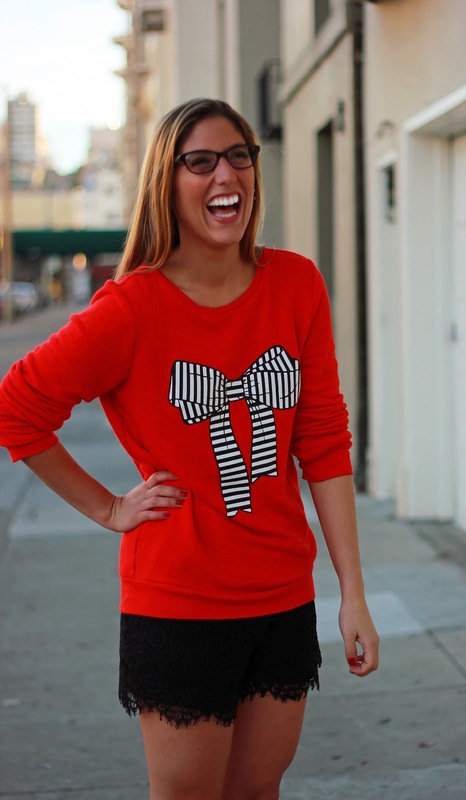 I love bows just as much as the next girl…and OBVI You! ha! So glad you found my blog! I'm your newest follower too! love love everything about this look especially the sweater and heels! so gorgeous! Such a cute sweater. Very festive. SO cute! Lace shorts are so fun!